…….. And finally Czeching out. Pilsen, Czech Republic. 11th May 2014. Imagine that 1970’s scene. A cinder covered oval track. Four bikes at the start tape, waiting for the flag. Four methanol burning, fire breathing, four valve, 500cc single cylinder engines, exhaust noise splitting the night air, the smell of Castrol R wafting across the track. One gear, no brakes, acceleration faster than a Formula One car and riders with balls the size of bricks. And all of those engines would have been made by JAWA Motorcycles. Remember this? The results sheets from your local scrambles track swiftly changing, as the ‘60’s wore on,, with AJS, BSA, Triumph and Norton being replaced by CZ, that annoying manufacturer of two strokes from Czechoslovakia. It was enough to make a BSA sales manager weep. 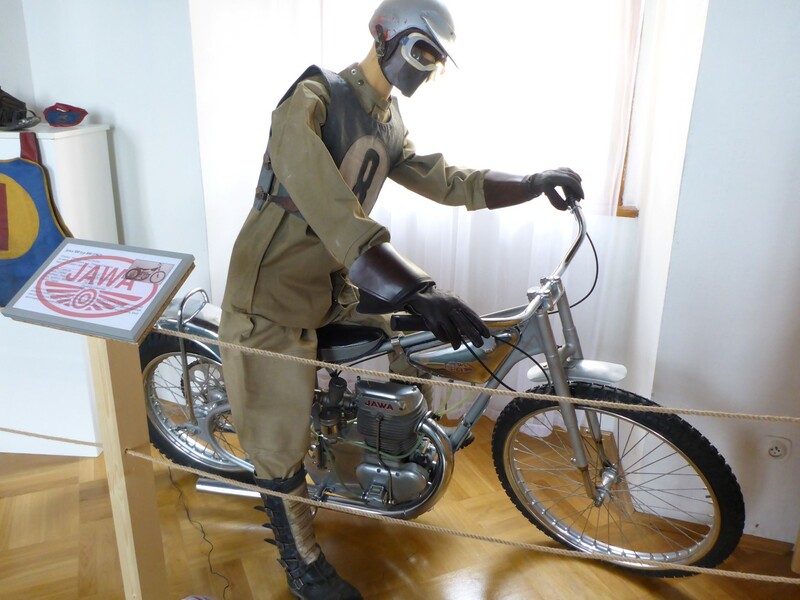 I remember the rise of JAWA and CZ in the 60’s and 70’s so there was no way I was going to leave CZ without visiting one of the museums set up to celebrate them. 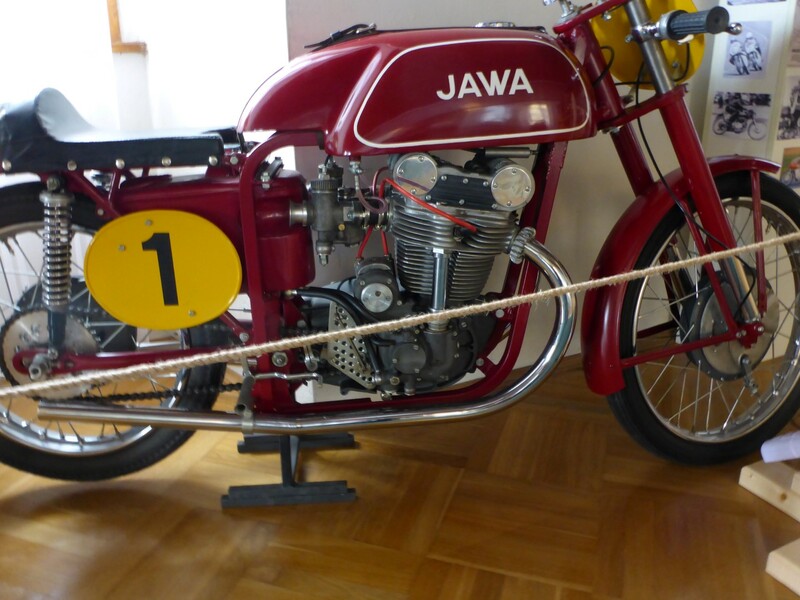 Although starting life as two companies, JAWA/CZ became one in 1948 under communist rule and that was when their racing successes began. Most of their output was two stroke commuter bikes in the case of CZ, or larger workhorse two and four strokes in the case of JAWA. British motorcyclists looked down on them and the riders who appreciated the cheap motorcycling they provided. But there was no denying the changes they wrought on the racing scene. CZ was eventually sidelined by the Japanese manufacturers, who often copied their successful designs, only more cheaply. The manufacture of JAWA speedway engines continued under a separate company when the main factory folded. CZ no longer make motorcycles. Some internet research led me to decide that Kamen castle was likely to be the best of the three museums to visit, mainly because its website didn’t say ‘No Photos’ and it was easiest to get to. I’d left Cesky Krumlov that morning in drizzly rain, which suited my mood. I had enjoyed my stay there, one of the reasons being the nice woman who ran Hostel Skippy, where I stayed. She was of Chezch/Cuban origin and had dark complexion and brown eyes to match. She was the kind of person who touches your arm and looks deep into your eyes as she talks to you. She was a jazz singer as well as a hostelier and I could imagine……. Well, I could just imagine, that’s all! So I pushed on northwards in the blustery drizzle. I met four guys on Harley Davidsons at one point and we rode along together for a while until they decided to blast off into the distance. Thanks for the company guys. When I got to Kamen Castle I found the museum but had the impression there wasn’t much else to see. To some extent a castle is a castle is a castle and this one was definitely a minor royal in the castle nobility rankings. 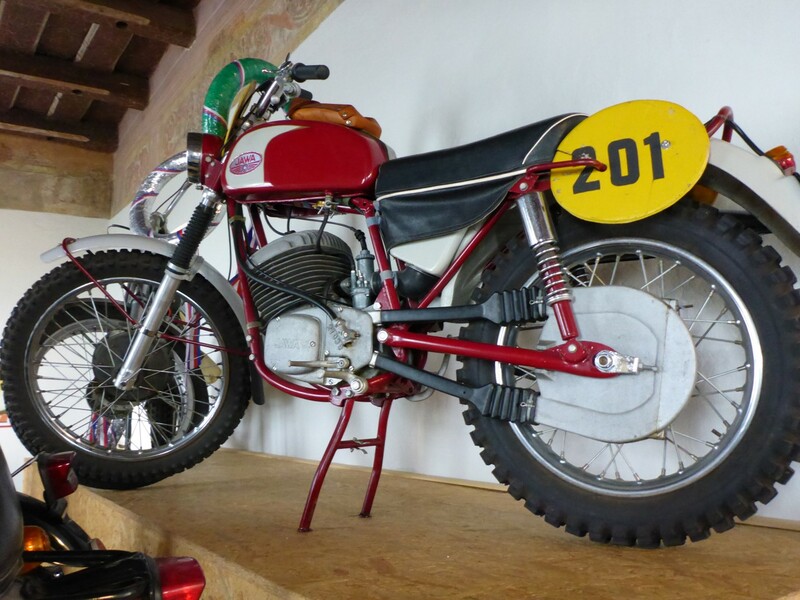 But filling spare space with motorcycles has always struck me as being a good idea and the JAWA/CZ collection was worth seeing, not only for the technical interest but also the reminiscence value. I refer you to my first paragraphs.Annoyingly this museum also had signs saying ‘No photographs’. But the young female custodian didn’t seem too bothered when I got my camera out so I snapped away happily. 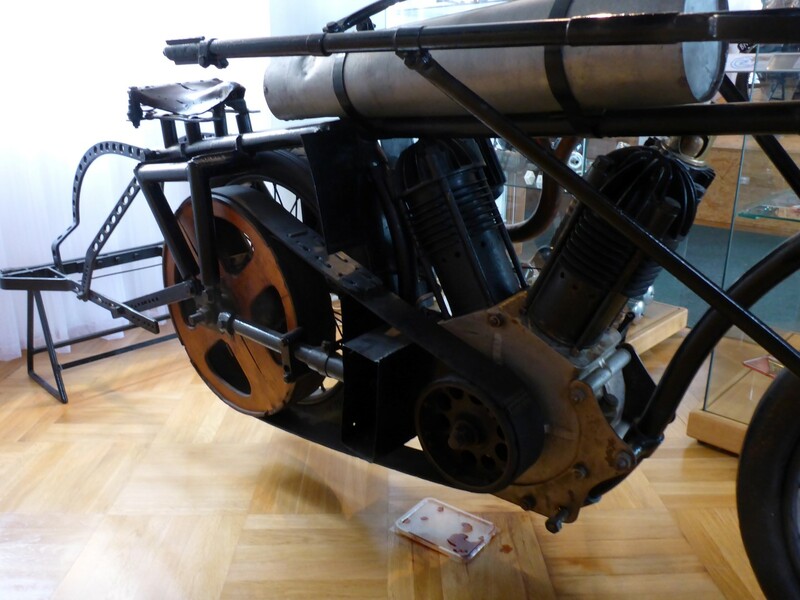 The collection seemed to represent most models from across the years, including the racing and speedway bikes, but there was one big old V twin that caught my eye. It’s from 1910 and I thought at first it was some kind of tractor or even a road roller. 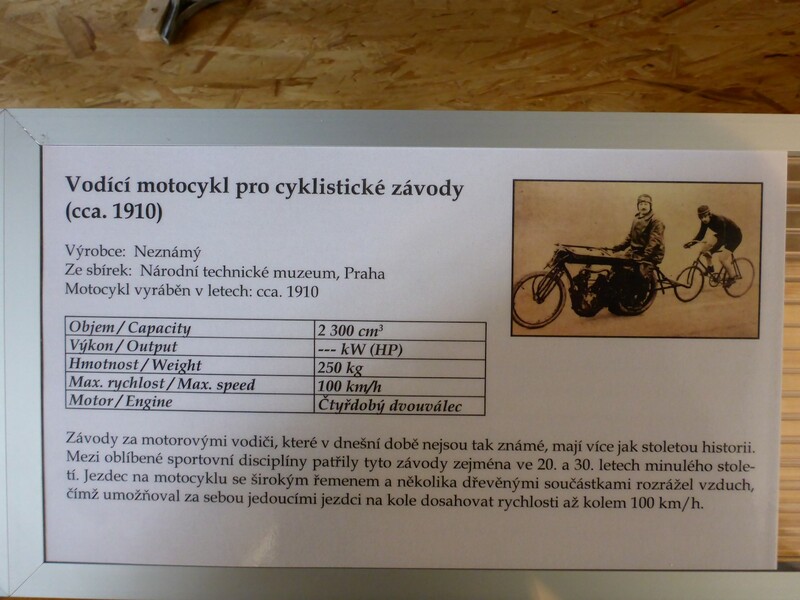 In fact it was used to help cyclists achieve speed records. The cyclist would ride up against the bar across the back of the bike, which rotated, and the bike and rider would shield him from the headwind, so enabling a higher speed. As far as I know this method is still used today although I suspect a modern cyclist would be able to travel faster than this old bike ever could. Raucous, methanol burning speedway bike. One of those all-conquering scrambles bikes. And here’s what it did. Enough looking at them, time to ride mine. Tonight’s destination is to be Plzen, better known as Pilsen, home to Pilsner Lager. To be honest I’m not sure why I ended up going there because I was heading back to Prague next day. I think I had some plans to pop back into Germany but I’d changed my mind by then. But having booked a place in the hostel I stuck with it. One of the main sights to see in Plzen is the brewery but that didn’t appeal to this non drinker and I’d visited breweries before anyway. There are other cultural delights in Plzen but the hostel wasn’t all that close to them and the weather was still a bit damp so I took the rest of the day off. Some hostels are great, some offer mixed standards and some are a bit naff. This is what I’ve come to learn at this point. The hostel in Plzen was just plain weird. When I got there the receptionist rang up her boss and then put me on the phone to him. I really couldn’t understand what he was trying to tell me, mostly because he was outside somewhere and the connection wasn’t all that good. But I think he was trying to get me to stay somewhere else. How odd. He gave up in the end and the receptionist took my money and showed me the room. The place was rather run down, with broken kitchen units, lukewarm water and floors that needed sweeping. I realised that I was on my own there and I think it had possibly been closed ready for work to be done, hence the phone call from the owner. I was left to my own devices and asked to make sure I put the key back through the letterbox when I left in the morning. I didn’t feel like walking round the town looking for an eatery and as luck would have it there was a place next door that supplied takeaway meals. Rather than being a shop, it was the kitchen that supplied the meals that had been ordered over the phone or the internet. I walked in there and they were happy to supply me with a pizza, big enough to feed me that evening and for breakfast. It’s surprising how things just fall into place sometimes. Next day’s ride to Prague started out showery but it soon cleared up. I’d booked a hostel on the north west side of the city as there were a couple of sites I wanted to visit nearby. Staying in a hostel in Prague – how nice! How warm! Pension Sprint turned out to be a modern building and I was able to park my bike on the entranceway. The owner Jakob was there, who spoke excellent English and after we’d chatted for a while he asked me if I was native English. When I said yes he asked me if I’d be able to help him with something. Jakob pilots light aircraft. He is also involved in pilot training. He asked me if I’d be prepared to read out some passages of writing for him to record. In return for this he’d upgrade me from a bed in a dorm to a twin room all to myself. It’s a deal! All I had to do was to read out, as naturally as possible, some brief stories, all of which related to planes or flying. He uses these to help his pupils learn English well enough to be able to talk to air traffic control. The international flying language is English and he not only expects his pupils to speak it but be able to answer questions on the passages they’d learned to read too. It’s a similar regime to comprehension that I remember doing in English lessons at school. Later that evening we sat down and recorded the passages and Jakob declared himself satisfied. He has had other native English speakers do the same thing for him and what we’ve recorded will be used with an instruction manual he’s writing. He’ll even mention me and my journey, he told me. Fame at last! I offered to help him with proof reading too, if he wanted it. We chatted generally about flying and I told him I’d always wanted to get a Private Pilot’s Licence. His opinion was not to bother. He said to take up gliding, it’s cheaper but more challenging. Hmm, food for thought! It was great to have a room to myself and I was able to get some washing done and to have a sort out of my gear. Constant unpacking/repacking always means the occasional tidy up is needed. 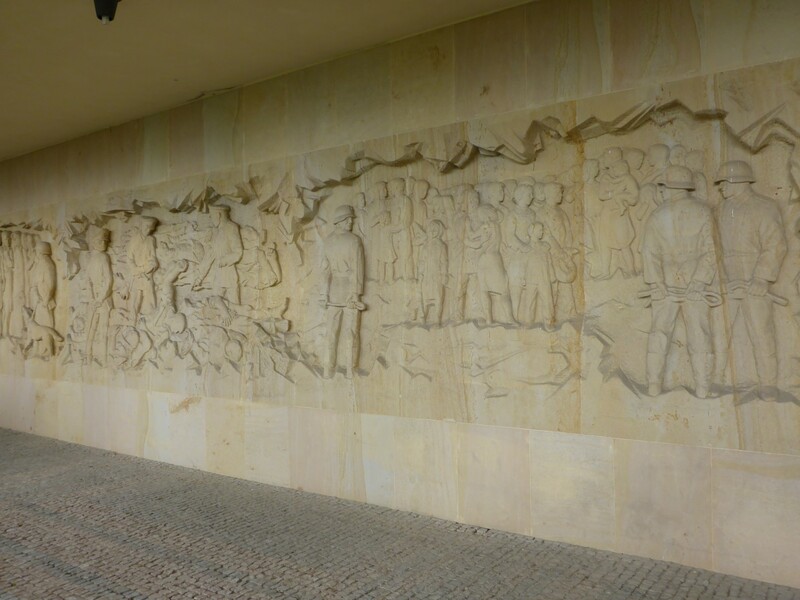 My destination for the next day was Lidice, not far from Prague. Lidice was a small village of 503 inhabitants that suffered an unbelievable fate at the hands of the Nazis. After the assassination of Reinherd Heydrich, Deputy Reichs-protektor of Czechoslovakia in May 1942 by London trained Czech resistance soldiers, the Nazi regime was looking for revenge. 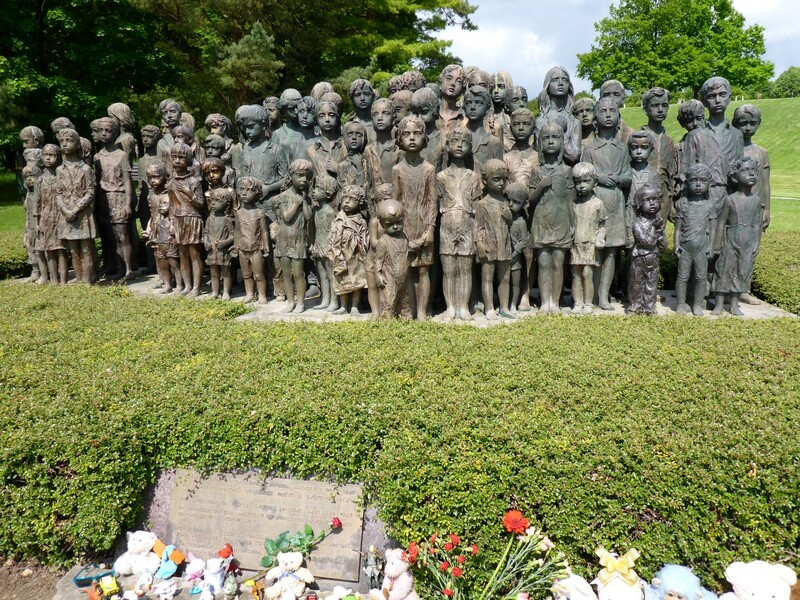 For reasons still not fully understood they chose Lidice on which to take their revenge. Not only did they decide to murder or remove every inhabitant, they also decided to eliminate every trace of the village itself. 173 male inhabitants were lined up and shot, in groups of ten, by SS troops. 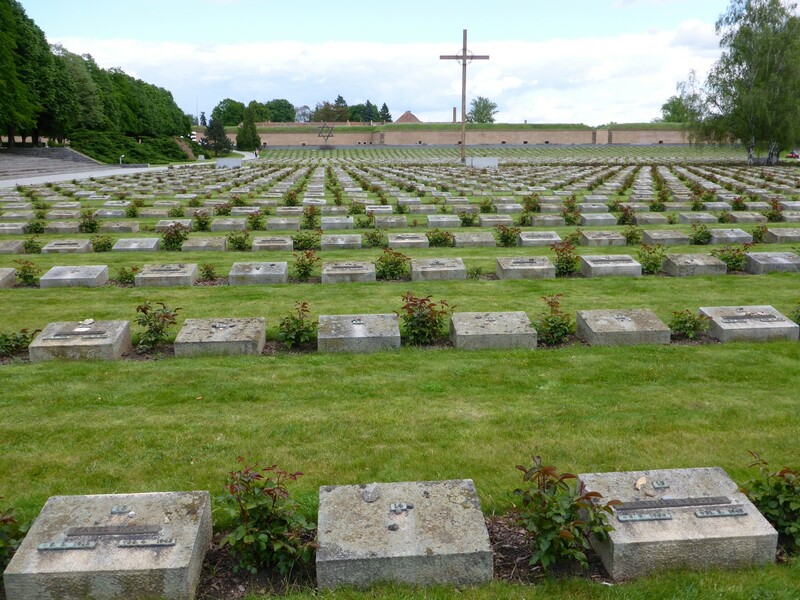 All of the women were sent to Ravensbruck concentration camp, were many died, and most of the children were sent to Chelmo camp where they were murdered. The exceptions were those chosen to be sent to families for ‘Germanification’ and babies under one year old. Part of the tableau that forms the memorial wall. A memorial sculpture of the Lidice children. The village itself was then razed to the ground, the foundations were dug up and the crops, fields and orchards were ploughed out. The village ceased to exist. Except that it didn’t. The Nazi’s action shocked the world. Other villages chose to change their name to Lidice and female babies were given the name too, and still have it. 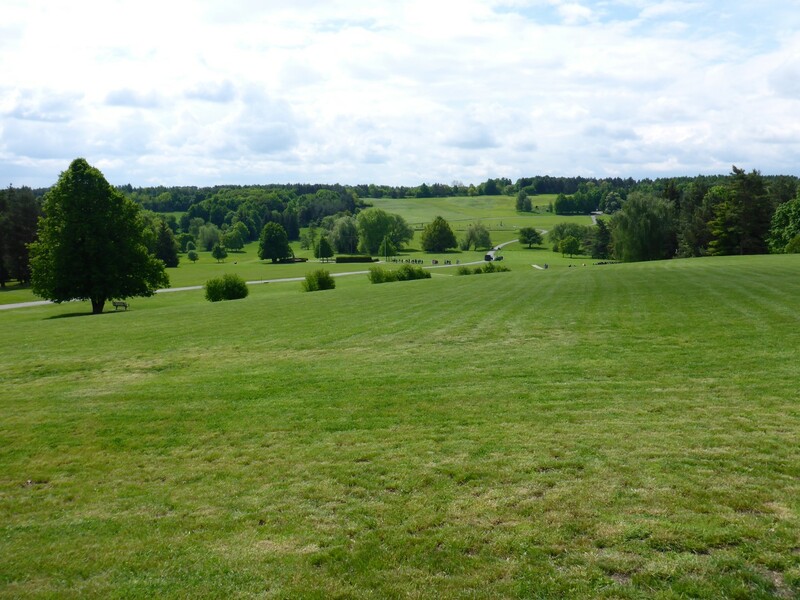 After the war the Czech authorities decided to build a new Lidice and to set up the old site as a memorial. This was were I went next. Where the village used to stand. Nothing left! There is a museum there and various memorials to those who died. The Nazis filmed their actions and it can be seen in the museum. There are also filmed interviews with some of the surviving children, some of whom were too young to remember their parents, others who ‘learned’ to forget Lidice at the hands of their German foster parents. In the end 143 Lidice women survived to return to the new village and 17 of the children were reunited with their mothers. This story is tragic but largely unconnected to events in Britain although there is a link. The new village houses an art gallery, an important part of the Lidice memorial. A key figure in the ‘Lidice Shall Live’ movement was an English Doctor, and later MP for Stoke on Trent, Sir Barnett Stross. Other villages suffered a similar fate under the Nazi’s. In 2008 the Oyaji Bikers visited Oradur Sur Glan, a French village where all the inhabitants were killed as an act of revenge for an attack on SS troops by resistance fighters. But that village was left standing and has been left as a memorial by the French government. There are others too but Lidice was the only one were the Nazis attempted to remove all traces of it. Back at Pension Sprint I chatted with Jakob for a while but I had developed a cold so took the chance to get an early night. Tomorrow’s plan was to visit Terezin and then head for the hills, the ones that take me out of Czechia that is. Terezin (Theresienstadt) is a garrison town that was built for the Austrian army in the mid 19th century. It was named in honour of Empress Maria Teresa and consisted of a citadel, the Small Fortress, and a walled town, the main Fortress. From the mid 19th century the small fortress was used as a military prison. The town lies in Sudenteland, the area of Czechoslovakia that was sacrificed in order to appease Hitler in 1938. When the Nazi’s took over the rest of Czechoslovakia they decided to take advantage of the ready made security of the town by setting up the Prague Gestapo Police Prison in the small fortress. This became on of the few Gestapo run concentration camps and it housed dissenters from and resisters to the Nazi cause. 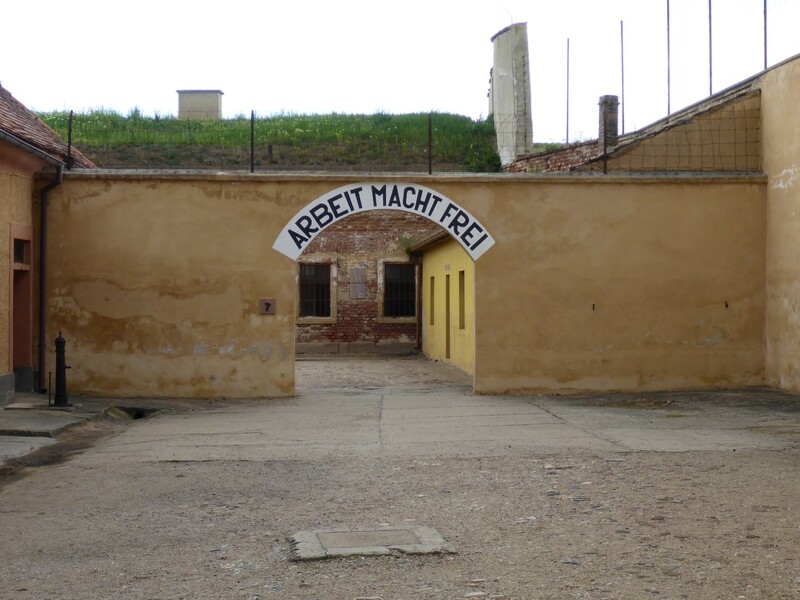 Most were only held temporarily before being tried and then moved on.But many died there because of the harsh conditions or the cruelty of the guards and any Jews were treated very badly. Some were simply summarily executed. 32,000 prisoners passed through there, of whom 5,000 were women.As time went by more and more of the prisoners were Jews, sent there from other camps, usually for breaching the rules in some way. When the Nazi’s decided to put into effect their Final Solution they cleared the Czech citizens out of the rest of the town and turned it into a Jewish Ghetto, to where they transported Jews from other parts of Czechia and Europe. Most of these were the more cultured Jews, i.e. Intellectuals, artists, writers etc. Many of them were well known abroad. They were kept there because of their international status and the Nazis’ need to have some showing of consideration for their position in front of the world. Some had even earned decorations from Germany in WW1. They suffered poor food, poor sanitation and, as time went on, severe overcrowding leading to outbreaks of disease. When the overcrowding got too bad they simply sent a few thousand to Auschwitz for extermination. The ghetto was visited by the Red Cross twice and on both occasions the Nazis tarted up the Ghetto, dressed people up nicely, especially the children, and forced the Jews to put on concerts and plays. Trouble makers were sent to Auschwitz, as were enough Jews to reduce overcrowding during the visits. The ruse worked because the Red Cross always wrote good reports. A very rare example of the Gestapo using this dreadful phrase. One of the rooms at the fortress which would have housed dozens of captives. At the end of the war, after the release of the Jewish inmates, the sad story of this camp continued. It’s an unfortunate fact that many German families had settled in Czechia over the previous centuries and some of these welcomed the Nazis, although most didn’t. 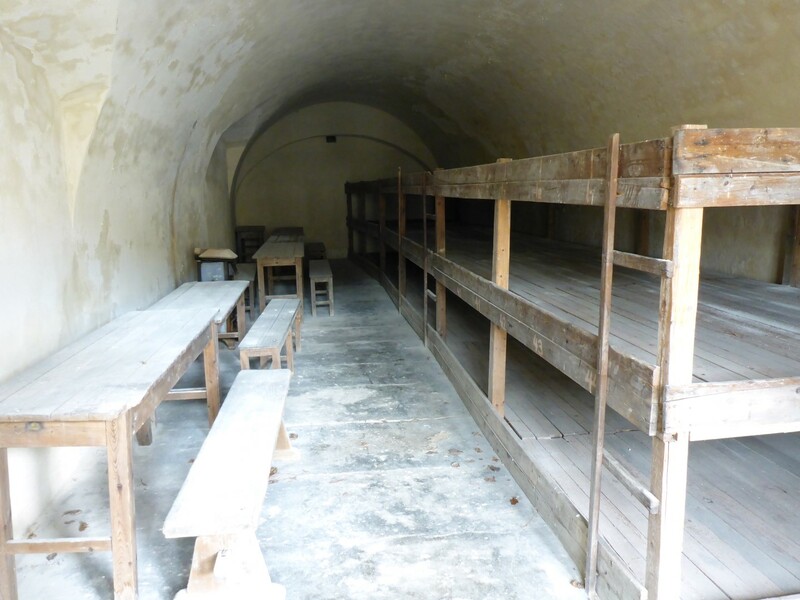 But it was decided to deport all Germans and Terezin was used as a transit camp. The small fortress was used to house the war criminals among them. A visit to the Small Fortress and the Ghetto Museum was on my list. They are the two places that explain the wartime history of the town. The fortress and the ghetto were separate entities in their daily running although people moved from one to the other. Sadly, rarely back again. It is simplest to buy a guide for the Small Fortress and use it to walk round the site. Each important building is numbered and then there’s an explanation about it in the guide. This meant I could take my time really understand what went on here. Needless to say, visiting a site such as this has its macabre side but everything is very well explained and the guide is well written. I think it’s very important to understand what went on and, for that reason, I was very pleased to see plenty of school kids there. It’s a moot point as to whether knowing about historical atrocities helps to discourage people from supporting future ones, but it’s right to increase awareness and understanding as much as possible. Start ‘em young! The memorial to those who died at the Small Fortress. On of the things I really likes at the Small fortress was a display of art. 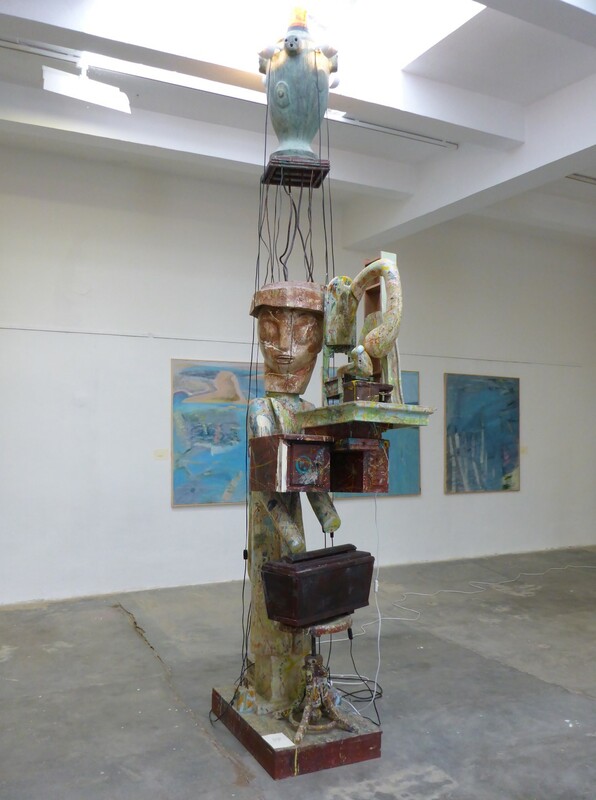 I saw some interesting sculptures, the kind of thing I’d like to be able to make myself. They look a bit thrown together but I have no doubt they’re not. 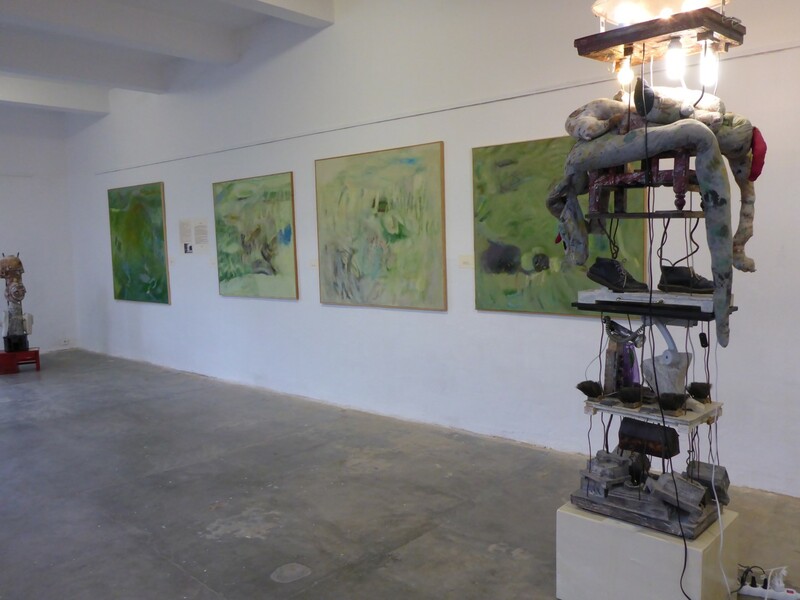 Another sculpture and some of the paintings. I rode round to the Ghetto Museum, had a chat with an English coach driver as I was parking up and went inside. There are two types of display in here. One is a series of information panels detailing the rise of Nazism and, in particular, that history from the Czech point of view. It’s greatest detail relates to the life of the Jews in the Ghetto. It tells how the Ghetto was run by a Jewish council, which had no choice but to carry out the orders of the Nazis, which were given orally. It also tells of how a facade of cultural life was maintained, both of these situations helping to convince the Red Cross, as previously mentioned. Nicely sums up what all the suffering was about. 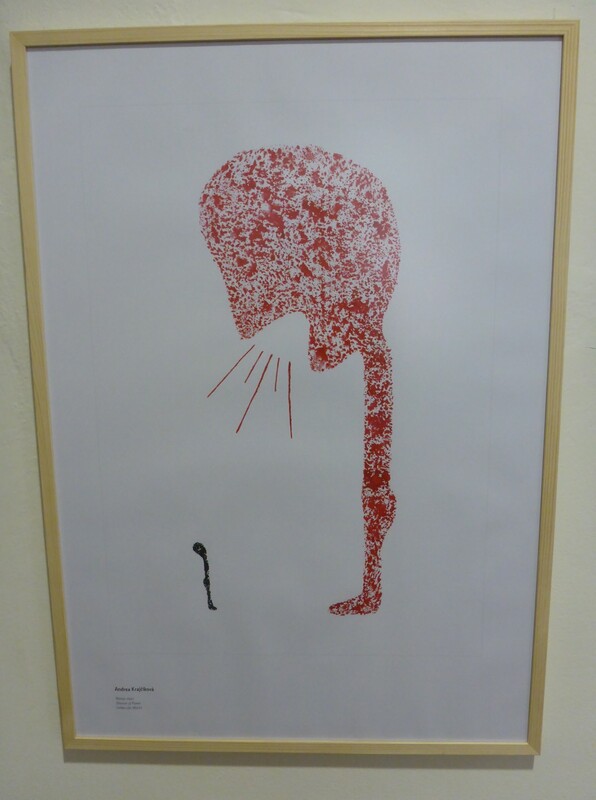 The other part of the exhibition was artistic. 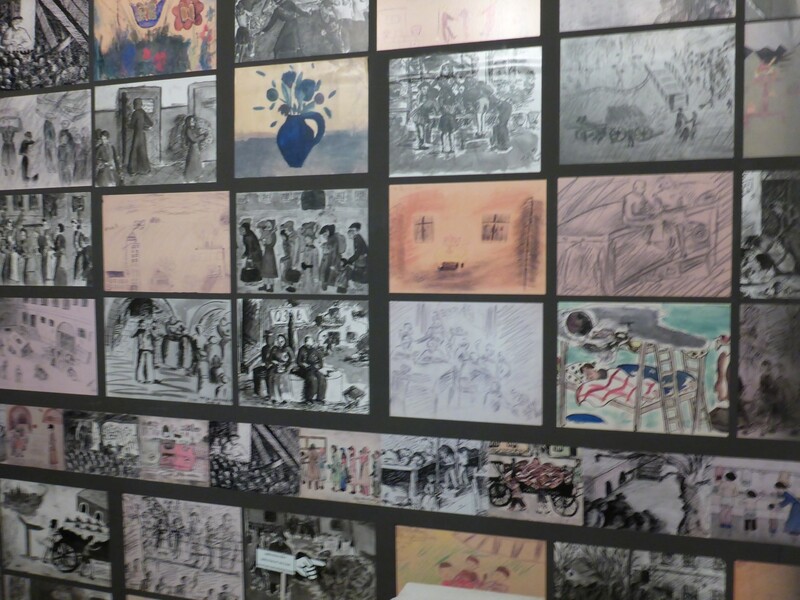 There was a display of drawings made by the Ghetto children, depicting life as they experienced it. Sadly, most of those children died. There are letters, diaries and photographs that somehow escaped the censors and they depict the horrors of daily life in the Ghetto – disease, deprivation, how the dead lay among the living for days before being removed. Really dreadful stories. 87,000 people were deported from Terezin to other camps. Only 3,600 survived. 34,000 died in the Ghetto or Small Fortress. Paintings by the Ghetto children. One of the displays I did enjoy was by an Israeli artist. He drew pictures relating to various events throughout Jewish history and quoted religious verses along side them which he believed related to the events. It helped me to a greater understanding of how Jews use their religious faith to help them understand the events in their history. So that was Terezin. Well worth the visit as it depicted some specific events and showed a particular facet of the Nazi regime. It was interesting how art was used at both Lidice and Terezin to try to heal the wounds. I have no idea how common this is but it struck me, at both places, as a good thing to do. Leaving Terezin, I headed for the German border and my last act was to turn off the motorway to fill up with cheap Czech fuel. I was very amused to find a series of ‘Border Bonanza’ outlet stores, all selling goods which were clearly cheaper in Czechia than in Germany. The entrepreneurial spirit is alive and well! And now I really was heading out of Czechia, a country I had really enjoyed spending time in. Its culture and history is rich, if at times tragic, but the people seem to have shaken off the misfortunes of Nazism and, in particular, Communism, and appear to be making great progress as part of the EU family. I started to learn much that was new to me about Central European history, which brought to life all those stone walls and statues. Everybody was welcoming and helpful to me and people show a real desire to make progress. It was an important cultural centre during its past history and it’s easy to see why. Farewell Jakob and thanks for the nice room at Pension Sprint. I hope your book sells well. I’ve visited the site of Oranienburg concentration camp and also the ‘Stasi prison’ in East Berlin. On both visits the descriptions of the atrocities that had happened where I was standing brought me close to tears, so I’m not sure that I could have coped with Lidice and Theresienstadt in such quick succession. Thanks once more for your kind comments David. I find myself able to separate my feelings at the time of these visits but maintain a burning anger within at the easy way in which the world seems able to forget the past and carry on doing these things, albeit it not in Europe at the moment.